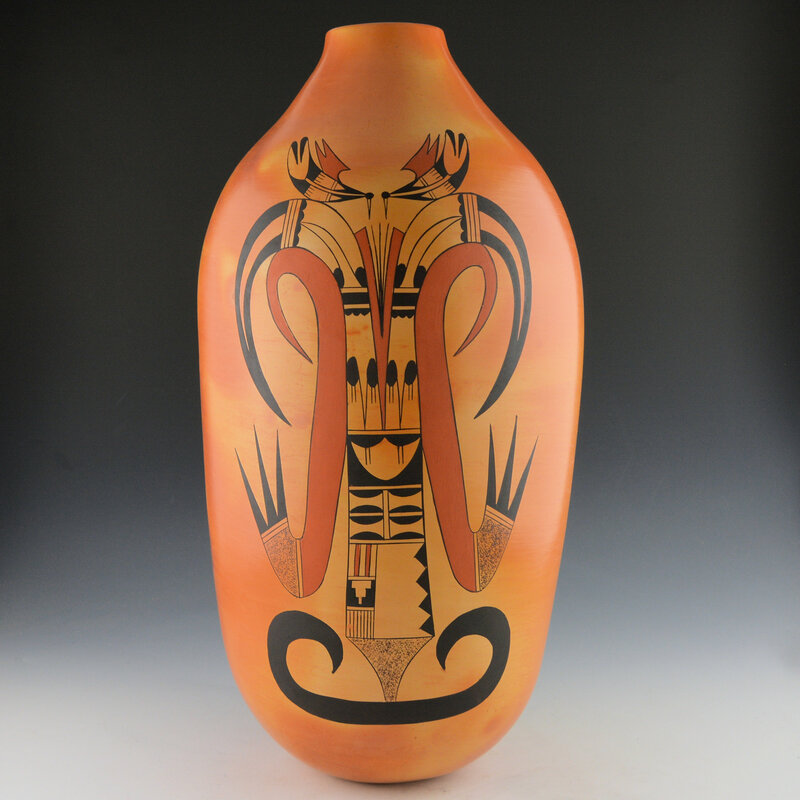 This is an exceptional tall jar by Debbie Clashin. She is a cousin of noted potter Mark Tahbo and a descendant of Grace Chapella. 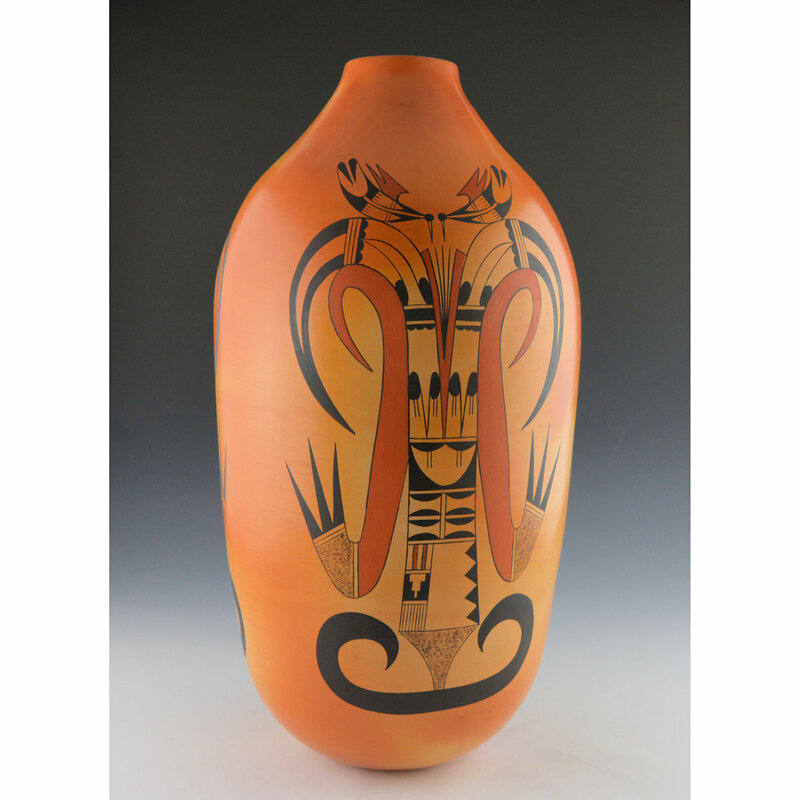 Debbie has quickly become well known for her large-sized traditional Hopi-Tewa pottery. This tall jar has straight sides and a short neck. The difficulty in this type of shape is to get the sides even and straight. Her addition of the shoulder and the slight neck is a strong variation in the form, as it seems to give it feeling of completion. The design is one that I first saw her cousin, Mark Tahbo, do years ago. It is a Koshari clown depicted three times around the piece. Look in the center of the design and you can see the eyes, then the headdress and the arms and legs. Certainly, it is stylized but a wonderful way to combine Hopi-Tewa culture into the pottery designs! The Koshari Clown is a staple at most Hopi ceremonial dances, but also at the Rio Grande pueblos. 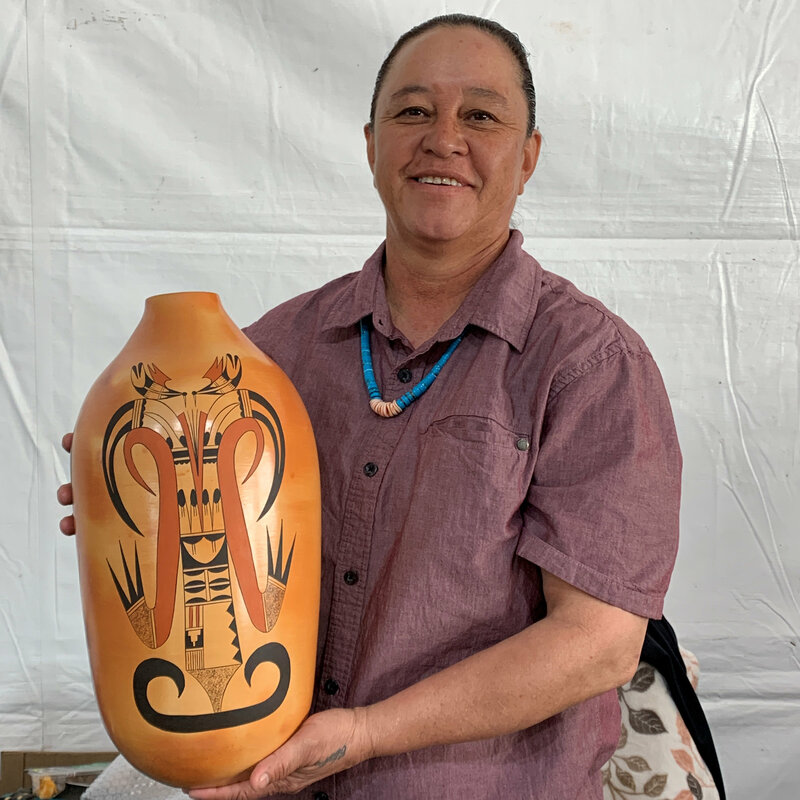 It is one of those cross-over figures who can be traced to the diaspora of Tewa people after the return of the Spanish in 1694 after the Pueblo Revolt. The figures here are tightly painted with thin lines and the mottled surfaces add a nice variance in design. 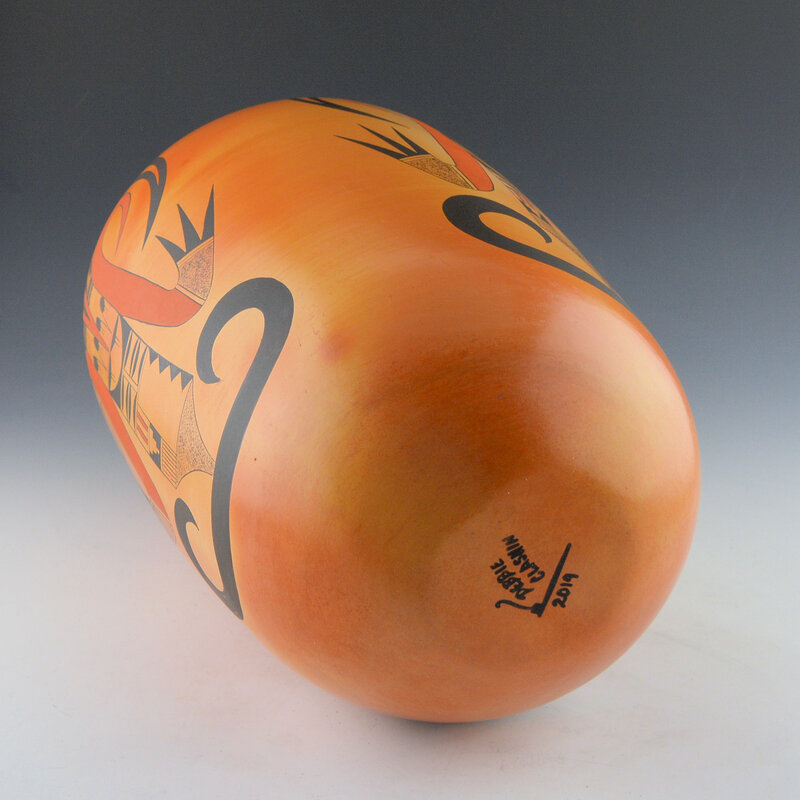 There are also two small birds on the top of each of the Koshari figures. They are again reminiscent of Mark Tahbo’s style. 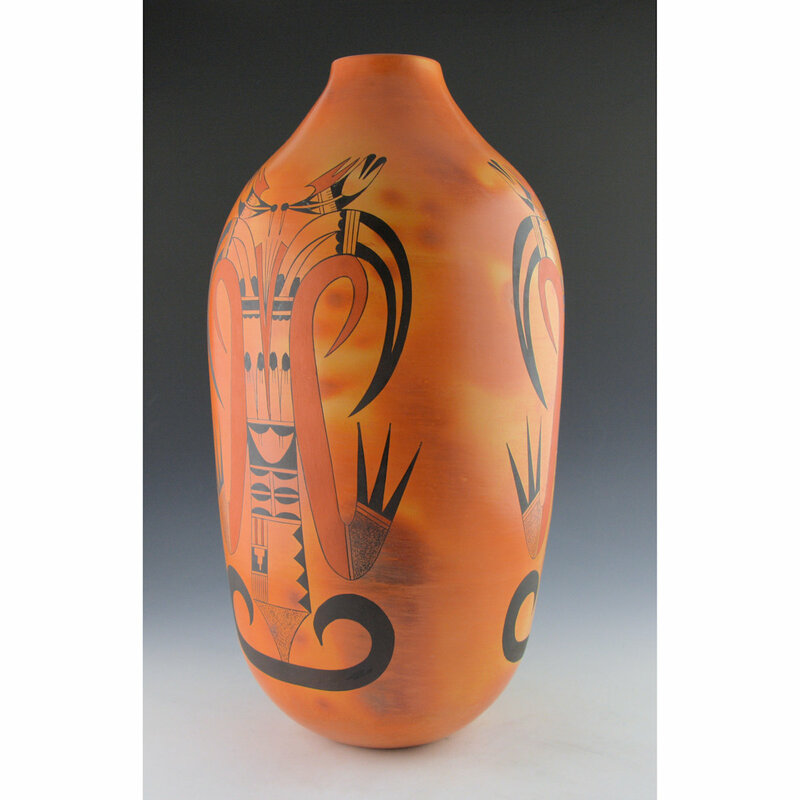 The jar is traditionally fired with intense colorations from the fire clouds across the surface of the piece. The open spaces and their color ranges add to the “design” of the jar. The black is all bee-weed and the reds are natural clay slips. It is signed on the bottom with her name and a pipe for his “Tobacco Clan”. The last photo is one of Debbie holding the jar for scale.